The short answer (which probably wasn’t terribly helpful to him) was: It’s “X-Men” meets “Groundhog Day.” The real answer, which required a lot of stumbling and bumbling and twists and turns, was far more lengthy (and probably not terribly helpful, either). Because even though I’d just seen the exact same movie my son had, I wasn’t sure I completely understood it, either. The latest adventure from Tim Burton would seem tailor-made for his tastes but it’s a convoluted slog, dense in mythology and explanatory dialogue but woefully lacking in thrills. It’s been a matter of diminishing returns with Burton for the past several years now between “Alice in Wonderland,” “Dark Shadows” and “Big Eyes” (although the animated “Frankenweenie” found the director in peak retro form). “Miss Peregrine’s Home for Peculiar Children” allows him to show only brief glimmers of the gleefully twisted greatness of his early work such as “Pee-wee’s Big Adventure” and “Beetlejuice.” The characters here are supposed to be delightful—or at least interesting—simply because they’re superficially odd, and it just isn’t enough anymore. Too often, it feels like we’ve seen this movie before—and seen it done better. 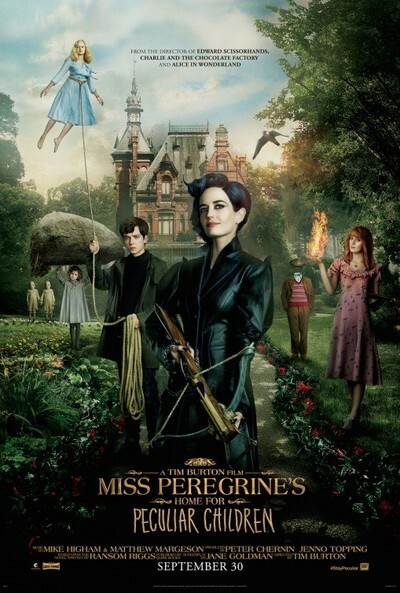 Although the film (based on the novel by Ransom Riggs) is populated by an assortment of peculiars, as they’re known—kids born with unusual abilities that make it difficult for them to live in the outside world—precious few of them feel like actual human beings whose lonely plight might carry some emotional resonance. There’s Emma (Ella Purnell), the pretty blonde who has to wear lead shoes so she doesn’t fly away. There’s Olive (Lauren McCrostie), the redhead who has to wear gloves so she doesn’t accidentally set things on fire. There’s the girl with a ravenous maw hidden on the back of her head. The invisible boy who likes to play tricks. The girl who can make things grow super fast. The boy who can project images through his eyeball. The creepy, masked twins. They flit in and out, do the thing they do, and ta da! Then they’re gone without leaving much impact. Their leader is the stylish and formidable Miss Alma LeFay Peregrine, played by Eva Green, who nearly saves the day simply by showing up with that vampy, riveting screen presence of hers. With a shocking swoop of midnight-blue hair and an array of gorgeous gowns from frequent Burton costume designer Colleen Atwood, she has the ability to manipulate time (and turn into a bird, which seems unrelated). But that isn’t enough. She also has to be extra quirky by smoking a pipe. And the seemingly regular kid who stumbles upon all these freaks and geeks is the incredibly boring Jake, played by “Hugo” star Asa Butterfield. He’s our wide-eyed conduit, so of course he has to function as the straight man in such a wildly fanciful world. But there’s just nothing to him, and the young British actor’s American accent seems to flatten him further. You may have noticed I haven’t tried to describe the plot yet. Yes, I am procrastinating. Shy, teenage Jake lives in a bland tract house in suburban Florida (on the same street as Edward Scissorhands, possibly). He dreams of being an explorer, he says, but he would seem to lack the requisite get-up-and-go. All his life, he’s heard his beloved grandfather (Terence Stamp, who departs far too quickly) tell him outlandish stories about his own youth on an island off the coast of Wales, where he grew up at an orphanage for misfits with magical powers. When Jake finally does find the stately, gothic home his grandfather had told him about, he discovers it’s in ruins, the result of a bombing decades earlier during World War II. But once he steps inside and begins investigating, the inhabitants dare to pop their heads out and the place comes colorfully to life. Seems they’re stuck in a time loop, doomed to repeat the same day in September 1943 right up until the moment the Nazi bomb fell on them. The time-conscious Miss Peregrine explains that she winds the clock back 24 hours at the end of each night, just before the moment of destruction, allowing everyone to relive that day all over again. Doesn’t that sound fun? Are you still paying attention? Anyway, for some reason, all the kids want Jake to stick around, ostensibly because they haven’t seen a fresh face in about 70 years, and his will do. But they’re all in danger, you see, because just as there are good mutants in the “X-Men” world, there are also bad ones. Here, they’re the peculiars who use their powers to take over other time loops, or something. And they way the stay alive is by eating people’s eyeballs, or something. Their leader is the courtly yet menacing Mr. Barron, whom Samuel L. Jackson plays with the kind of scenery chewing he could do in his sleep. But what they want is never clear, so they’re never truly frightening. The supposedly epic collision between good and evil results in exactly one exciting action set piece. It involves stop-motion animated skeletons battling an army of long-limbed, eye-gouging mercenary giants at a boardwalk amusement park, and it’s the only scene that vividly recalls the kind of artistry and absurd humor that long have been Burton’s trademarks. And the peculiar who makes it all happen has the most useful—and the most ethically intriguing—ability of all. Enoch (Finlay MacMillan) can bring things back to life—a person, a creepy doll—by inserting a beating heart into it. Unfortunately, though, he ends up being just another cog in the particularly dull machinery. Video Interview: Samuel L. Jackson on "Miss Peregrine's Home For Peculiar Children"